Mention hiking and it’s a fair bet that most people will think of the Lake District. Over the years it’s become the hiking centre of Britain. From Wordsworth’s rambles among the daffodils to Wainwright’s lovely guides to the area, hiking and the Lakes have been inextricably intertwined. It’s perfectly understandable. The area offers some of the country’s most stunning scenery, and there are plenty of challenging hikes. But they don’t all have to leave you huffing and puffing. 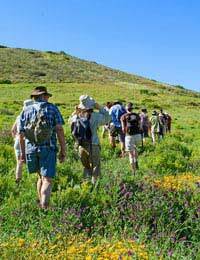 There are trails that run from the easy to the very difficult so no matter what type of hiking you enjoy, there’s something for you. Easedale Tarn is a good climb from Grasmere, but if you access it from Far Easedale the slope is quite easy, leaving you far out in the country at the tarn itself (although it should only be attempted in the warmer months when the ground isn’t boggy). The round trip from the village is four-and-one-half miles, something in the range of most hikers. The Castlerigg Stone Circle, made up of a number of standing stones about three thousand years old, stands about two miles out of Keswick, an easy stroll that starts on the Penrith road. In addition to the stones, the usual route takes in a side trip to Tewet Tarn before returning to the circle, after which you can return to town. Derwentwater has Walla Crag, a walk of a little over four miles with some remarkable views, starting just after the car park in Ashness Gate. There is a little climbing, but the slopes are relatively easy and should be accessible to most hikers. You go all the way to the crag and return to the car park by a circular route. At six miles, the walk to Wansfell Pike can be classed as moderate, and most hikers will allow four hours for the round trip. It begins in Ambleside and goes up through some spectacular waterfalls at Wansfell Pike itself and Stock Ghyll Force before reaching Jenkin’s Crag, which offers a view over Lake Windermere that’s well worth the climb. Most people know the name Helvellyn, the second highest mountain in England, but only those who want a challenge will try to hike it. The length of the walk is only eight miles, but you should allow up to seven hours for it. Unless you’re an experienced hiker you shouldn’t attempt this, as the scramble along Striding Edge isn’t easy even for those who’ve been walking for many years. That said, the view from the top is one to make you forget the difficulties you overcame to reach the summit. As mountains go, Scafell Pike isn’t one of the world’s greats. It’s only a little over three thousand feet. But it’s the tallest in England, and that alone makes it worth scaling. It’s a very steep, relentless walk to the top, and the seven miles there and back are likely to take you five hours or more. Be sure you’re in good shape first. If you’re not you probably won’t last the course; it’s been know to defeat even seasoned hikers. But beating it is a real achievement.